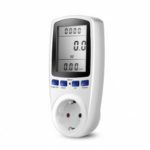 This German Plug Power Energy Consumption Watt Meter will measure the energy and cost of the household appliances. 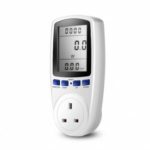 It&apos;s great for measuring Power(W), Energy (kWh), Voltage, Amps, Hertz, Power Factor and Minimum & Maximum Power. Wide Application, Perfect for measuring Power(W), Energy (kWh), Voltage, Amps, Hertz, Power Factor and Minimum & Maximum Power. Large LCD display for your easy reading. Simply plug the meter into the wall and then plug your appliance into the meter. Overload Protection, LCD displays the OVERLOAD with booming noise to warn the users.